Modagrafics is a leader when it comes to large-format printing and vehicle fleet branding. The company was in search of a fleet management and coordination solution, without which the tracking of the graphic kits and maintenance of the record of contractors and their agencies became a tedious task. They also required an ordering tool and reporting tool for one of its clients. 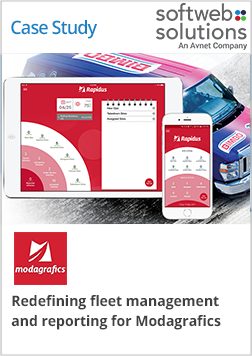 Softweb developed an enterprise mobility solution to enhance Modagrafics’ fleet operations. Also, for ordering tool, Softweb came up with a solution in the form of a website that would allow Modagrafics’ client to place orders and get details regarding current and past orders.